When the U.S. Department of State announced Thursday that the U.S. would leave the United Nations Educational, Scientific and Cultural Organization (UNESCO), scholars of the U.N. may have felt a certain déjà vu. The Trump administration's statement cited "mounting arrears at UNESCO, the need for fundamental reform in the organization, and continuing anti-Israel bias at UNESCO" as reasons for the decision. Those rationales echo arguments made by the administration of president Ronald Reagan in December 1983, when the U.S. previously announced a decision to pull out of UNESCO: " UNESCO has extraneously politicized virtually every subject it deals with. It has exhibited hostility toward a free society, especially a free market and a free press, and it has demonstrated unrestrained budgetary expansion." But there may be another reason why the U.S. doesn't see UNESCO — from which it also cut funding in 2011 — as crucial to its foreign policy. Experts in the history of the organization say that the U.S. simply doesn't have as much power there, or as much need for the group's work, as it did when UNESCO first started. When 37 nations created UNESCO as a human rights organization promoting education, science and cultural causes in November 1945, "it was essentially a western entity, dominated by western funding," says political scientist Jerry Pubantz, co-author of To Create a New World? American Presidents and the United Nations and co-editor of The Encyclopedia of the United Nations. School systems in Europe were undergoing "denazification" and, as part of that process, the U.S. wanted to be sure that they taught World War II accurately. UNESCO was a way to influence those curricula. Likewise, during the Cold War, American officials imagined UNESCO as an advocate for free speech in an era of communist propaganda. But, as more members joined the group — about 160 members by July 1983 — U.S. policy makers grew worried their voices would be drowned out. The newest members were "largely the decolonized new independent states of Africa and Asia" who "tended to be less supportive of American policies, and more supportive of the Soviet bloc’s position," says Pubantz. 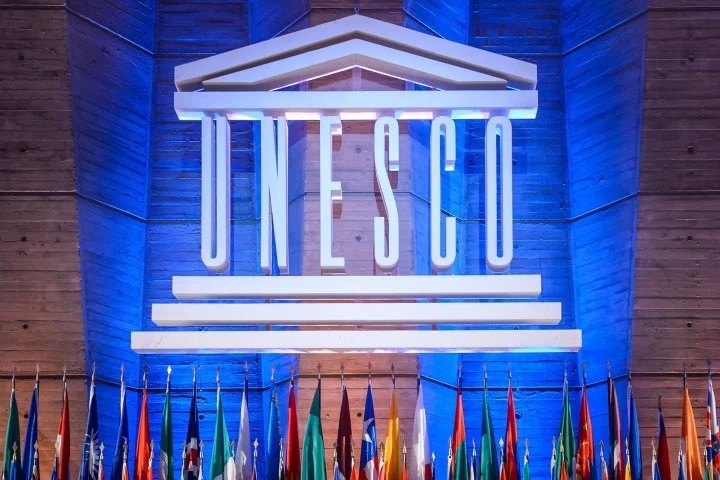 In addition, some U.S. officials soured on the group because, despite the new members, they felt the U.S. was left footing a disproportionate amount of the bill for UNESCO's work. Or Jeane Kirkpatrick, who represented the U.S. at the U.N. put it, "The countries which have the votes don't pay the bill, and those who pay the bill don't have the votes," as reported in a Jan. 9, 1984, article. The first real scuffle came in 1974, when UNESCO voted to exclude Israel from a regional working group because it allegedly altered "the historical features of Jerusalem" during archaeological excavations and "brainwashed" Arabs in the occupied territories. Congress promptly suspended UNESCO 's appropriations, which forced the agency to soften its sanctions. In 1976 Israel was readmitted; in 1977 U.S. funding resumed. In 1980, at the UNESCO general conference in Belgrade, a majority of Communist and Third World nations called for a "new world information order" to compensate for the alleged pro-Western bias of global news organizations. The goals were the licensing of journalists, an international code of press ethics and increased government control over media content. Although UNESCO backed off under pressure from the West, it still allocated $16 million for a two-year program to study "media reforms." The U.S. also chafed at UNESCO 's increasingly collectivist outlook. The agency's charter, like that of the U.N., commits its members to support basic human rights. In the past five years, however, the "rights of peoples"—in other words, the state—have taken priority over "individual" rights. The Administration was rankled further by what UNESCO bought with its money: a bloated bureaucracy with a taste for the good life. Despite UNESCO 'S stated concern for the Third World, few of its staff are deployed there. Indeed, 2,428 of its 3,380 employees work in the comfortable confines of the Paris headquarters, ,where a mid-level bureaucrat's salary is about $2,500 a month, tax free. Some staffers are better connected than qualified: the important post of personnel director went to Serge Vieux, the cousin of [UNESCO Director-General Amadou-Mahtar M'Bow's] wife. A final irritant was the autocratic M'Bow, who, according to Western members, pandered to Third World interests in hopes of some day getting enough votes to become U.N. Secretary-General. The voters who elected Reagan may have influenced the decision, too. Russell L. Riley, a presidential historian at the University of Virginia, adds that the rationale behind leaving UNESCO jibed with the Reagan administration's overall economic agenda: "It was an easy way to save a little money and could prove to Americans that we [U.S. government officials] were being fiscally responsible." Yet even after Reagan left office, rejoining UNESCO did not seem to be the top priority. For one thing, the U.S. had won the Cold War, as Riley points out, so many of the original reasons the U.S. had been eager to be a part of the group had faded. And it would have been a hard sell in Congress in the 1990s, especially with Reagan stalwart Jesse Helms chairing the U.S. Senate Committee on Foreign Relations. The U.S. did not rejoin until the country's foreign-relations calculus changed once again. The announcement came around the one-year anniversary of 9/11, and scholars see it as part of the American effort to rally the international community around a global war on terrorism. "By the time George W. Bush came in, I think there was a sense that [UNESCO's] anti-U.S. bias had eroded," explains Stewart M. Patrick, senior fellow at the Council on Foreign Relations and author of the upcoming book The Sovereignty Wars: Reconciling America with the World. "It took a George W. Bush to go back into UNESCO because no one would be of the opinion that he’d be soft and coddling U.N. globalists." And during the conflicts in Iraq and Afghanistan, UNESCO, which designates World Heritage sites, has played a role in restoring cultural centers that have been destroyed.What hasn't appeared to change between the post-World War II era and today, Patrick notes, is the global concern about whether truthful information is being shared freely worldwide. In 2017, with fake news and information censorship a concern for many people around the globe, it remains to be seen how the U.S. decision to pull out of UNESCO will affect that conversation.